Everyone has heard a song that has changed their life, and that is what Chase Bell is going for every time he writes a song. Originally from New Jersey, Chase became immersed in music at a very young age. His mother was a jazz singer performing in New York City, so naturally, jazz and blues would provide the foundation for his musical approach. At just 19, Chase left the US to live in London and Rome, performing and recording his own original music, which had by that time evolved into more of a Pop / Rock sound. Since then, he has cemented himself in L.A., in his own professional recording studio, where he writes, records, and produces his own music, as well as the music of other artists. Chase’s music has been heard on movies and TV, including FOX’s “Lucifer”, various Lifetime movies, award-winning commercials, and PSAs. He frequently collaborates with his sister, actress Emma Bell, of “The Walking Dead, Dallas”. Chase has recorded over 200 songs and has written thousands of songs since he started producing and writing music. Every song he writes is an opportunity to re-create himself. As he writes and produces his third full album, he gets to re-invent himself with every song. He believes that often we think that re-invention is something that takes a long time, but really we are always inventing ourselves over and over. 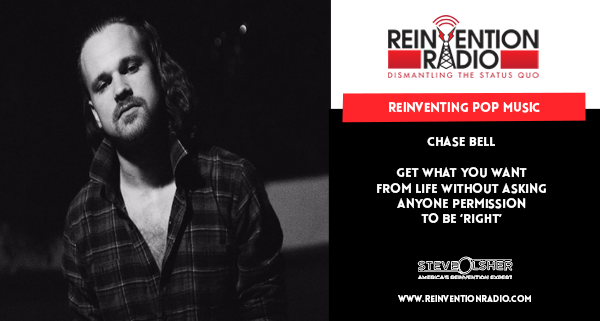 Tune in to hear Steve, Mary, and Richard chat with Chase about getting what you want from life, without asking anyone permission to be “right”. Forgiveness or permission when using the music of others? Reinventing Authority – In this episode, tune in to hear Steve, Mary, and Richard chat with Mike Saunders, MBA about creating and leveraging authority to get more sales.